Did you knwo that before development of dental implants, dentures were the only alternative to replacing a missing tooth or teeth? Not everyone in Towson is a candidate for a dental implant, however. For a successful implant to take hold, a candidate must have proper bone density and have a strong immune system. In all cases, dental implants require strict oral hygiene. One of the main reasons why patients like Dental implants so much is becuase they are so well designed that they mimic the look and feel of natural teeth. No one even knows if you have them. 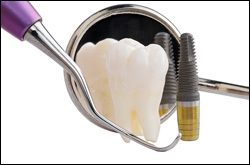 Implants are usually made of a synthetic yet biocompatible material like metal or ceramic. Like any restoration, implants require diligent oral hygiene and proper care to ensure they last a long time. If you think you might benefit from Dental Implants call Joseph M. Dickens, D.D.S in Towson at (410) 583-0800 today!